The first couple weeks of school might be the most free time you’ll have, before all your time is spent report, writing and publishing, and other class workloads spike, to put together your 2018-2019 staff page. The staff page can be a fun team building activity, if you do it right, and can, at least, get new staffers acquainted to your website. 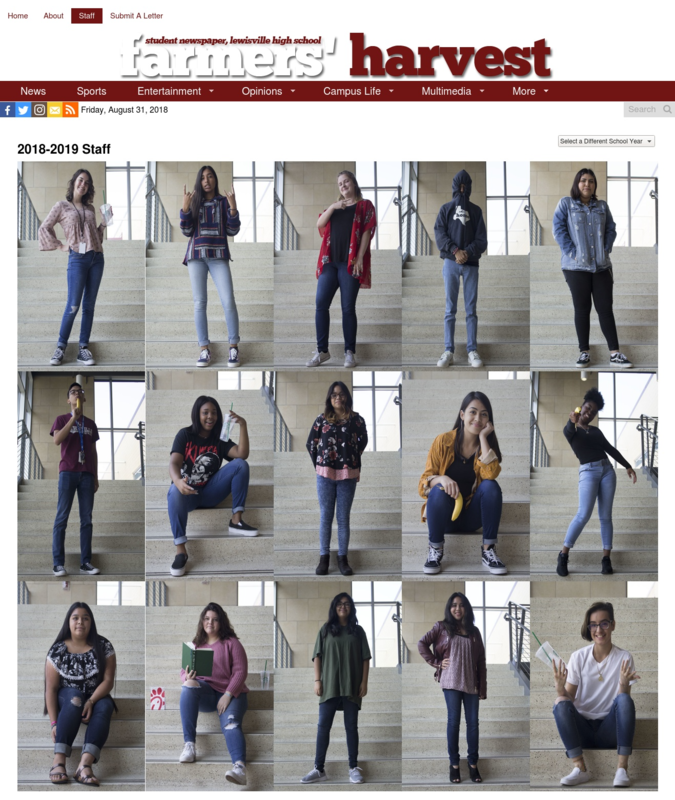 With full-body, vertical photos, the Lewisville High School staff’s style is one you’re not going to see on many other staff pages (including the ones on this list!). And that is just really awesome! Look how cool it can look when you have what fits the 2:3 Vertical Photo Ratio option in the Staff Page settings. With 15 profiles, they also set the page to have five columns of photos, creating three perfectly-assembled rows. Notice their subtle use of props, too — empty Starbucks cups, bananas, a bag of Chick-fil-A — as if it’s needed… their poses exude personality on their own. What a total classic! These Lafayette High School staffers know you don’t have to have a photo studio to setup excellent portraits. There is a lot of skill exhibited in these photos, but that they’re all taken in the same location is what helps produce a great-looking page. It’s a bonus in this Profile Preview format to get at least a little bit of each student’s biography out on the first page their readers will see when they click “Staff.” The bio is the place where each individual student can get most creative, while the page overall is best done as a team. There’s a theme developing, isn’t there? Consistency to the photography raises your staff page to another level. Here is another example with the news staff at New York University. This is a great example of how the Square Photo Radio option looks. The staff picked a red background matching that of the color on their site. Also, there’s an easter egg here. If you actually click on the link we’ve provided you, you’ll notice one profile isn’t human. That’s Crime Bot, a robot against a red background cropped the exact same as the human beings it shares the page with. For these or any other staff pages, also remember you can now reorder the staff profiles on the page to represent the actual hierarchy of the staff, rather than the date or order the profiles were published in. Learn how to do that here. It happens every August. Support tickets ramp up all of a sudden, and then we know only one thing can be true: school is back in session. We sure hope you’re settling in and excited to get your site up and running again. We’re back in your email inbox today, not to make you think too hard but to remind you that there we’ve got some cool new things for you. Updates to FLEX: Is there a rogue color orange on your site that you don’t know how it got there? Well then, you might not know where to change it. There are hundreds of different places to change colors individually, but only one place now where all colors on your site are listed together: Master Colors. These controls allow you to quickly change all instances of a single color to a new color. Buh-bye, orange! Master Colors can be helpful, but you’ll still be able to change colors individually like you always have, in the hundreds of different areas they show up throughout the SNO Design Options and Widget Control Panel pages. Hmm… what else? The Design Snapshots tool rolled out late last year. There’s no better time than the present to start using it. Don’t forget about the Above Header Full Width widget area either. There, you can put widgets ABOVE your header area. Do more with staff profiles, too! Reorder them based on staff hierarchy using the Staff Profile Order tool and put them at the bottom of stories with enhanced Story Page Extras options. Bundle Up: There’s a new way to buy those add-ons. The Site Booster Bundle packages together Sports Center, Form Builder and Ad Manager. The Education Bundle packages together the Unlimited Training Subscription and SNO FLOW. You can still buy the Unlimited Training and SNO FLOW separately, as well as mobile apps, email addresses, logos and headers, and individual trainings. New Narrator: Thomas, the knowledge center of SNO Support, re-recorded and added several new help site videos. So, now there’s no getting away from his voice, whether you call us for support or seek it on your own. The “Getting Started” videounderwent the biggest change, he says. It’s worth showing your new staff members. New Smart Guy: Join us in welcoming Noah Seichert to the SNO team! Noah will be the server and site technician making sure your online publications are running seamlessly. Easy Listening: A new podcast by SNO, titled SNOcast, will feature interviews with journalism teachers, students and working professionals. Listen to our first episode, an interview with former St. Louis Park High School student and Echo editor Annabella Strathman, this week! Stay tuned! More about the podcast and more about changes coming to Best of SNO (the way you submit stories for it) later! For now, better go ahead and start class already! It’s May, plants are finally blooming in Minnesota, promposals are yesterday’s news, and “Wrap it Up!” is flashing on the teleprompter out in front of us. So, this week we’re handing out some end of the year Best of SNO superlatives. And what a year it was for student journalism. Not unlike the national media, students had a lot to cover from all the people and events at your school to national movements that had especially local footprints this year. You crushed it. There’s so much more excellent work to check out. We hope you’ve enjoyed reading it all as much as we have. SNO will be raking in the frequent flyer miles again this summer, delivering on-site, SNO-centric digital media training at regional workshops throughout the country. Check out our summer schedule below, because you won’t want to miss us. Jayhawk Media Workshop, June 10 – June 15, Lawrence, Kan.
Media Now, June 25 – June 27, St. Louis, Mo. VAJTA JCamp, July 15 – July 19, Harrisonburg, Va.
MIPA Summer Workshop, July 29 – Aug. 2, East Lansing, Mich. Even sooner, come see us at our SNO booth next week at the JEA/NSPA National High School Journalism Convention in San Francisco, April 12 to April 15. Our workshop sessions are designed to help you grasp the creative power you have over your SNO site and use it to transform your publication. We’ll cover the basics and get into the advanced tools that’ll take your site to the next level. You’ll be introduced to the most up-to-date features, learn how to study analytics and master the best practices for web and social media. Can’t make it to a workshop? That’s OK. Order a personalized SNO training session or subscription and we’ll come to you virtually. Or host a SNO Day for member schools in your area and we’ll come to you personally. SNO Days are all about getting a close-up with your publication. We’ll bring the expertise, you bring the willingness to learn. We’ve already booked a SNO Day in Tampa, Florida for the fall. Want to know more? Or are you interested in hosting a SNO Day at your school? Get in touch with us. We’re excited to hear from you. Year after year, the Story Page Excellence badge (one of the six you need to earn SNO Distinguished Site status, for which you can enter here) proves elusive to even the best newspaper staffs. Why? More often than not, it’s about the long form template. Eventually, it clicks for everyone and they earn the badge. Just your luck, we’ve spotted a few long form templates out in the wild that are excellent, that you can use as helpful references. From West Side Story, Iowa City West H.S. A group of reporters set out to tell, “The stories of foreign students finding a new home in the United States.” It makes for a good example of using the long form template to string together a few separate, in-depth interviews about the same type of experience into one long feature — and you can use the Long Form template to establish clear separation between sections. They’ve created a super-clean, consistent design on the page. They threw a changeup using vertical featured images for each Long Form Chapter and it really makes the page pop. Each “chapter” is consistently put together — each with a large featured image, a second photo embedded, one pull quote and a related stories box. Each section has a different related story suggestion — drive that traffic! Low key, theirs is also a good example of when you can get away with not displaying the primary featured image on the story page. From The Harbinger, Algonquin Regional H.S. Writing about “Vape Culture,” as this article is titled, is trending this school year. We’ve seen a lot of different versions of the same story — especially coming through the Best of SNO log — but this one really makes an impact because of its appearance and all the extras. Notice how they’ve utilized the Long Form options from the SNO Design Options page, which allows you to put this story page template against a different colored background (off-black, in this case) than other stories. It goes really well with the lead photo, too. The variations in text color, style and size makes the page pop, too. They’re using sidebars at an expert level, so well that there’s no sense that other photos are needed, as you’d traditionally hope for, to break up all that text. This example is pretty striking. 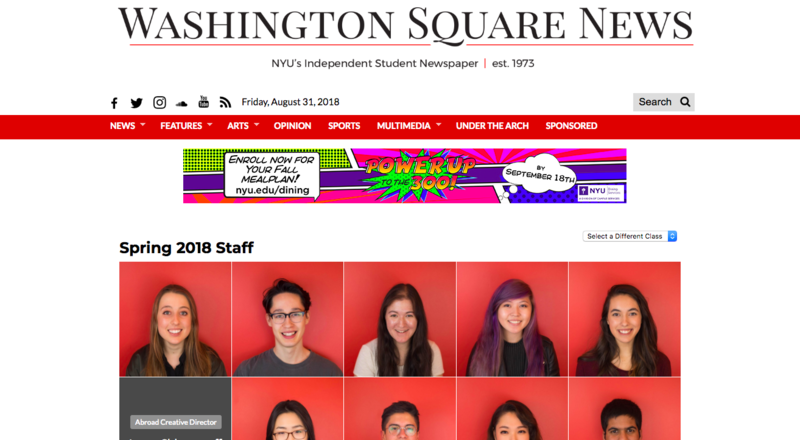 It’s another excellent example of a story fitting the template, with staffers of The Sunflower reviewing a chain of events related to the university threatening to take away its funding because of its displeasure with stories the staff has covered. Content-wise, it’s a statement as to why journalism is important. It’s separated into chapters, each with several headings within them to separate parts of that section, and it utilizes a good opening introduction in the Long Form Container — a good way to use that part of the template. Also, notice the custom graphic they created for the series. There’s a lesson in it: When at first there’s not an obvious photo to get, create a graphic. Think you have a good example the long form usage? Share it with the SNO community here. No matter the state of your site’s design, you still hopefully have some curiosity about what else you could be doing to sweeten it or what you might have missed in the weeds. Just how many examples, exactly? We’ve created 30 variations of the six widget styles available to you, which is a low estimate of how many different ways you could design them. We’ve got 7 different Story Carousels and 11 different Story Grids for your consideration. We’ve designed 6 different Category Widgets in full-width widget areas and 14 more configurations spread over all of the other available spaces. We also showcase the new Full Screen Widget and all three category page layouts, the widget-based option being highly customizable beyond what we show you. Not everything on the site is perfect, and that’s the whole idea. Sure, you can easily follow the instructions to recreate what you see there, but we also hope you’ll pick up on the small nuances of these designs and be able to combine elements to create something perfect. You can also visit our Award Winners and Design Showcase pages to see great examples in action, built by your fellow SNO Flakes. We just mailed out the plaque for our third SNO Distinguished Site of the 2017-2018 school year. Congratulations to West Side Story, of Iowa City West High School! They didn’t hesitate to go for the six badges available in the program and neither should you. Don’t wait! Enter your submissions now. We hear from our customers often, and one of the things we hear the most is that your want your website to get better. While the SNO support site, training materials, and videos help you improve your site year round, the request we get most often is for individual feedback. That’s why we’ve developed the SNO Site Review and Site Overhaul programs aimed at helping you improve your SNO website. Our Site Review program gives you an extensive, detailed evaluation by our expert. If your students won’t listen to your suggestions or you’re curious if you’ve been doing the same old stuff on the same-looking site for too long, this option could be for you. From site presentation to content execution to audience engagement, we’ll thoroughly assess how your site is doing, what you’re doing well, and actions you can take to make it even better. After you place an order, our expert will dedicate time to spend digging into your site, keeping a detailed report of observations, which will be submitted to you within a week at the completion of the review. Our Site Overhaul program is designed for those who need a little hands-on help. Whether you’re looking for a major shakeup or a simple facelift, if you want a modern, professional-looking site but there’s just no time to do it yourself or you have and you’re frustrated with what you’ve come up with, this option could be for you. Hand the reins over to our designer, then sit back and relax as we turn your site into what you’ve always wanted. Upon ordering, we’ll listen to any ideas and goals you have, look at the other sites you like, and create a plan, then our designer will contact you with an estimated work timeline. When finished, we’ll deliver a complete report that we can review via web conference to explain how and why everything was done. With the Design Snapshots tool, you can create and save multiple site layouts and toggle between them as needed. Using it with our Site Overhaul program, we’ll design two options for you, instead of one. So, not only will you have your pick of the litter at the completion of our work, you’ll have an additional layout in your back pocket if you ever want to use it. After your order, you’ll be contacted with an estimated completion date. We’ll review the changes with you via web conference when the work is done. While receiving all of the hands-on help of a traditional Site Overhaul, this option also allows us to simultaneously address one of the biggest problem areas for design that we don’t touch with any other overhaul type. Many of you often identify your Header as an area of concern, a less than desirable presentation of your brand. We’ll aim to fix that, taking you through our Logo Design and Web Header service, to give you an identity you can be proud of, with a full website overhaul afterward that incorporates the new Header perfectly — a complete reimagining of your site. When the work is done, we’ll connect with you via web conference to review the complete report of changes. Ready to take your site to the next level? Order your SNO Site Review or Site Overhaul today. For any publication, whether your online arm is your exclusive means for publication or is in addition to a long-established print product — or for anyone transitioning from one to the other — this is the big question: How do we bring our readers online and grow that base? Well, if you’re online, simply being there opens your publication up to a much wider audience (all the Googlers and Yahoo-glers of the world), instead of only having the people in the building who have the paper handed to them. But if that was the only answer, this SNO Report would be awfully short and pointless. Spread the word around campus. Talk to your friends. Tell them about the website. Show them how it looks on their phones, since they’re already on it as you’re trying to tell them about it. Share on social media. We think everyone has a Twitter and Facebook account — that includes your staff members and all your readers. So, staff members should be sharing stories on social media, tagging their friends, interacting. By the way, your publication should also have a Twitter and Facebook to do this. On that last bullet point, yeah, social media is a big part of bringing readers in. But there are only so many ways we can tell you that, and we have a whole SNO Distinguished Sites program badge that outlines more guidelines. The SNO Report: What’s Happening On Facebook? This month, Facebook is instituting changes to its News Feed aimed at re-prioritizing the content you see, substituting news stories for more pictures of your aunt Ethel’s pet bird. Of the news leftover, Facebook is leaving it up to its users to decide what’s trustworthy, what’s garbage and what specifically they want to see. On a larger scale, Facebook is surveying users about whether or not they’re familiar with selected news sources and whether or not they trust those sources, in an effort to weed out the farcical mumbo jumbo that many still feel stained last year’s election. (That isn’t coming out with a Tide to Go pen.) On a smaller scale, users can pick for themselves what news, especially local news, they still want coming to their News Feed to fill the generally-fewer slots for news left in the algorithm. As a news source, there’s very little you can do to “win” this Facebook news purge. But you should start by educating your readers about what’s going on and what they can do to keep you in their shrinking news cycle. This is likely not the last change Facebook will announce about how news is distributed on its platform, nor then will it be final band-aid for you to apply as a news source. So, try your best to stay informed as all news organizations try to keep themselves on their readers’ radar. Thanks to Kathy Habiger, adviser to Mill Valley News, for sharing the story by The Kansas City Star that jolted the idea for this report. If you have ideas for future SNO Report topics, submit them here. https://customers.snosites.com/wp-content/uploads/2015/02/snologo-300x138.png 0 0 Tom Hutchinson https://customers.snosites.com/wp-content/uploads/2015/02/snologo-300x138.png Tom Hutchinson2018-01-24 14:31:372018-01-24 14:31:37The SNO Report: What’s Happening On Facebook? On Liberty High School’s Wingspan staff, there are reporters and photographers, editors and producers, and Samantha O’Brien. O’Brien’s in the corporate office, so to speak. 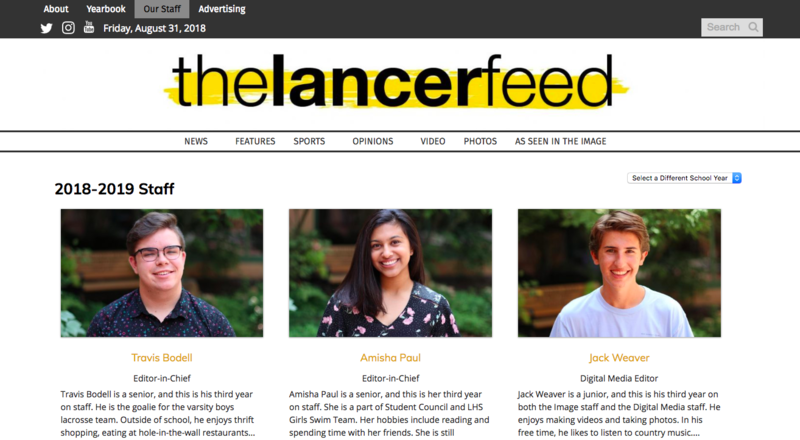 Though she isn’t on the ground floor turning ideas into fully-realized, published content online, she’s upstairs, as she says, “ensuring the staff is awarded for their hard work.” She’s the Contest and Competition Coordinator. Within a month of the SNO Distinguished Sites program being open for applications, O’Brien had Wingspan locked in as the year’s first distinguished site. Delegating a single staff member, whether its a top editor or creating a totally separate position, to navigate awards season on behalf of everyone else… sounds like a pretty good idea, huh? As O’Brien sees it, she’s an extension of an adviser or whoever would normally be in charge of applying for awards on staffs at other schools. It’s no throw away job. O’Brien has to stay plugged in to what’s being published, as she pretty much has free rein over which stories to enter into contests. Relative to the SNO Distinguished Sites program, it makes applying for Excellence in Writing, Multimedia and Continuous Coverage easy — she knows the criteria and can grab any content that matches. She’ll keep an eye on the site’s analytics to earn the Audience Engagement badge, and she helps the staff move toward Site and Story Page Excellence — the latter of which she says the staff knowingly plans content for. It was the staff’s goal to achieve Distinguished Site status as soon as possible. Mission accomplished. Now, Wingspan can carry that title with them throughout the last half of the school year.